Winter 2014 has not seen a great start. Chamonix saw some snow in early November but we are still waiting for a top up. With the recent foehn winds and relatively high temperatures the snow line has been going up rather than down. That being said there is good skiing to be had. With the Aiguille du Midi set to remain closed until the 20th of December it requires a short trip through the tunnel to La Palud to ski off the Italian side of the Vallee Blanche. Last Wednesday Jon Luckhurst and I hiked up and skied down the East face of the Tour Ronde. It was in excellent condition and only required a small down climb half way down the face to avoid some big rocks. We were treated to cold blower powder but it was a trade off with high winds and truly Baltic temperatures! Knowing that the Gervasutti on the Tour Ronde was skied that day by the likes of Briggs, Grant and Kilian (who reportedly lapped it 3 times!) I was keen to go back and ski this classic steep in good condition, direct from the col and better than I skied it in the spring. Tim Oliver and Sleigh were psyched to get ‘radical’ even if it meant braving more arctic temps and an early season 350m bootpack at 3500m. Setting off from the Torino refuge we knew it was going to be busy. Seeing crowds of people heading towards the Tour Ronde and Cirque Maudit we were a little apprehensive of what we would find. Upon arriving at the bottom of the couloir we saw 7 people booting up it. After digging deep and catching up with them only 4 were going back down, the others either skiing the North Face, which was in excellent condition or traversing to the east face via the summit. After a short wait for Sleigh we started off. Two skiers had gone down quick and steady on what looked like good chalky snow. The other two side slipped all 350m of the couloir and were a constant annoyance with the never-ending lumpy sluff. After some fast combat skiing I managed to get ahead of these two and exit the couloir as fast as I could. Fighting hot aches in the shade I awaited the other two before we headed back to the Torino for a sandwich in the sun. Overall the conditions are good up high. Not sure how tracked out the east face was but people were up, skiing and climbing everywhere. It looked more like a spring day off the midi rather than the start of December! 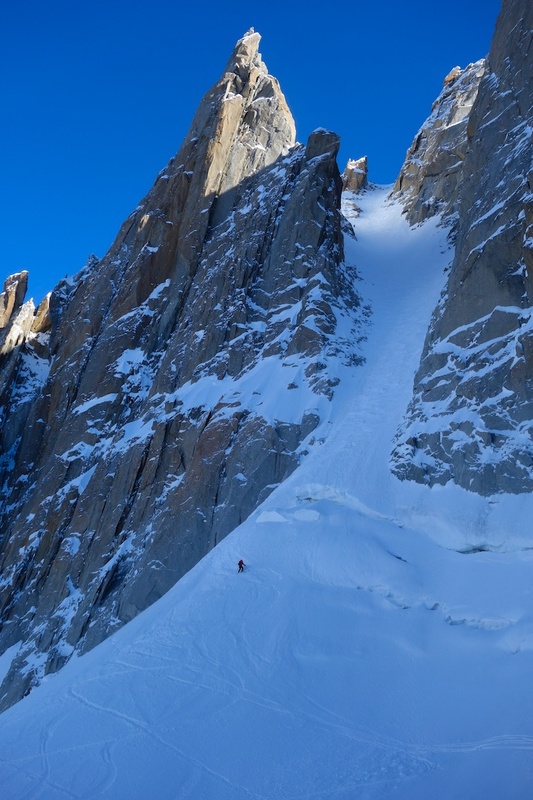 The Vallee Blanche is in desperate need of some snow before the midi opens to avoid a long and nervous walk out.